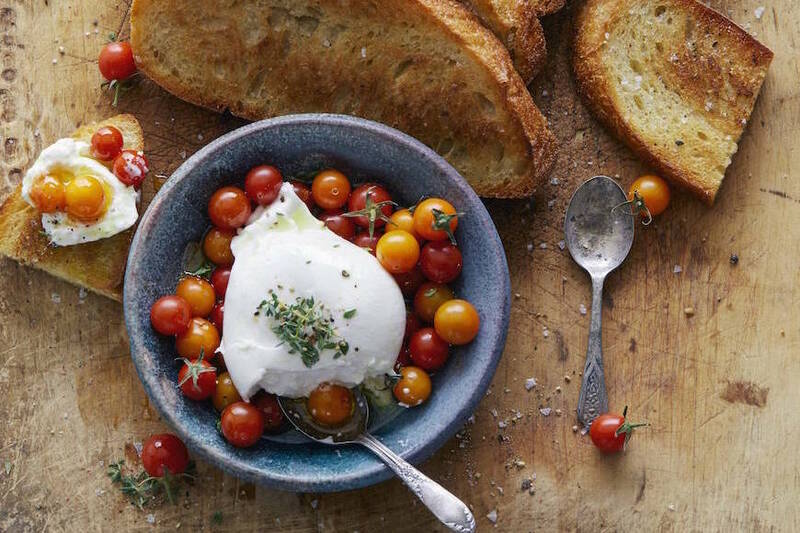 Burrata Tomato Toast – it’s the perfect breakfast, lunch or dinner ESPECIALLY because most of us across the states are living in an Indian Summer and it’s 90 freaking degrees in September! I’m ALMOST ready for fall… almost. But seeing as how I just got home from my favorite farmers market, and there are still tomatoes and strawberries coming out of every corner, I’m still functioning as if it’s summer. Earlier this summer, while we were in Peru, we stumbled across the cutest cafe (basically of all times) called El Pan de la Chola and poked out heads in. In typical form, we had just finished one meal, weren’t even remotely hungry, but ended up ordering a handful of things on the menu because the cafe was churning out the most beautiful bread of all times. One of the combos couldn’t have been more on brand – burrata, tomato, toast, thyme, salt and pepper. It was perfection. The burrata was creamy and salty and everything I could have ever asked for in life. 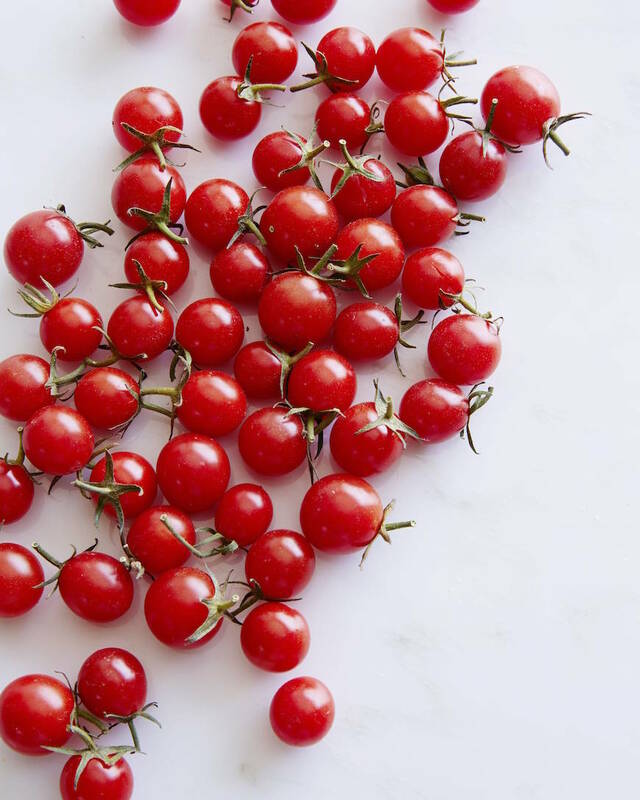 The itty bitty tomatoes were super sweet – just like the ones at the market this month! And I’ve been making it on repeat since coming home. Between this and my avocado toast obsession, chances are I might just turn into a giant piece of bread at any moment. 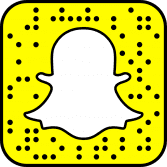 Whatever… I’ll deal. Pre-heat the oven to 350 degrees F. Drizzle the bread with the olive oil on both sides and place on a baking sheet. Bake for 10-15 minutes until toasted. Once toasty, remove the bread from the oven and carefully rub the garlic clove on top of the bread to infuse it with a little garlic flavor. Drizzle the cherry tomatoes with olive oil and season with salt and pepper. Place in a small bowl and add the burrata on top. 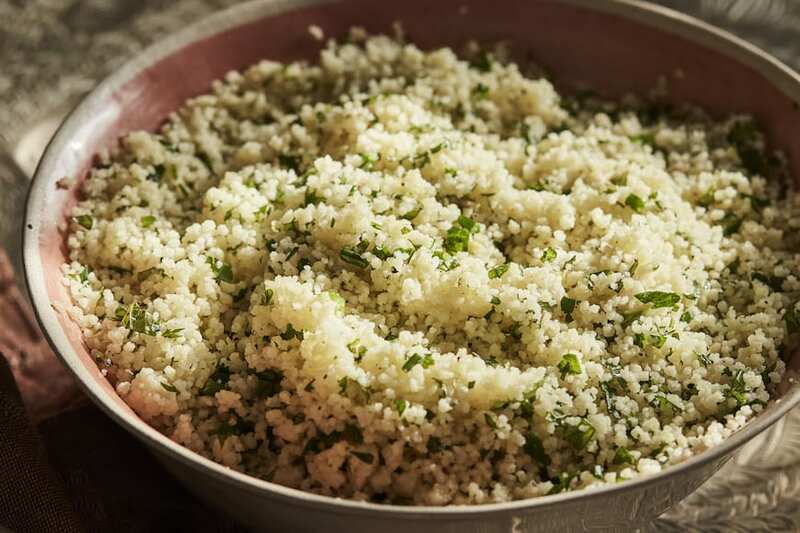 Dust with fresh thyme leaves and serve. To eat - slather a bit of the burrata onto a pieces of toast with a few cherry tomatoes. 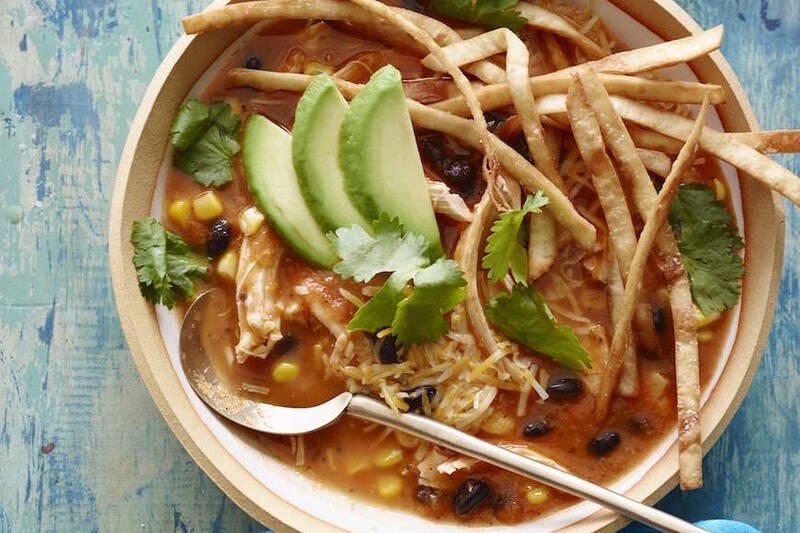 Makes for the perfect snack, brunch item, lunch or simple dinner! 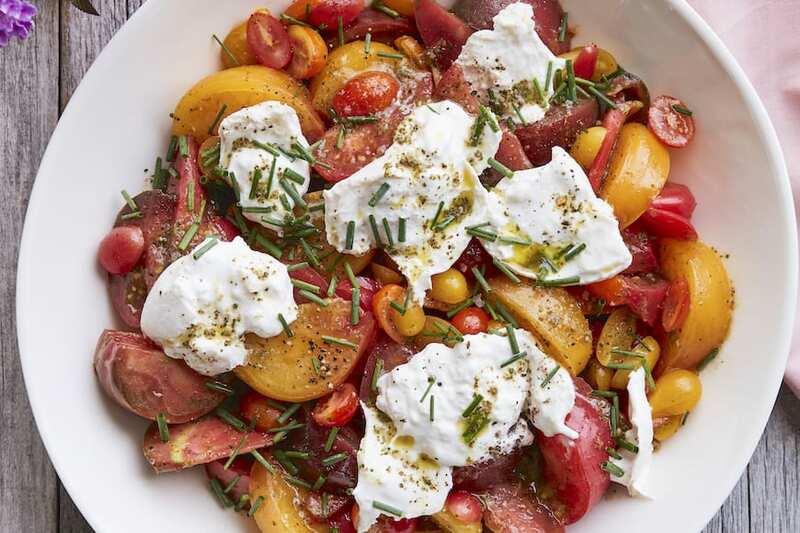 Love love burrata and tomatoes together!! Why have I never thought of this?!?! Pure deliciousness! This will be perfect with all the little tomatoes I have from my garden! 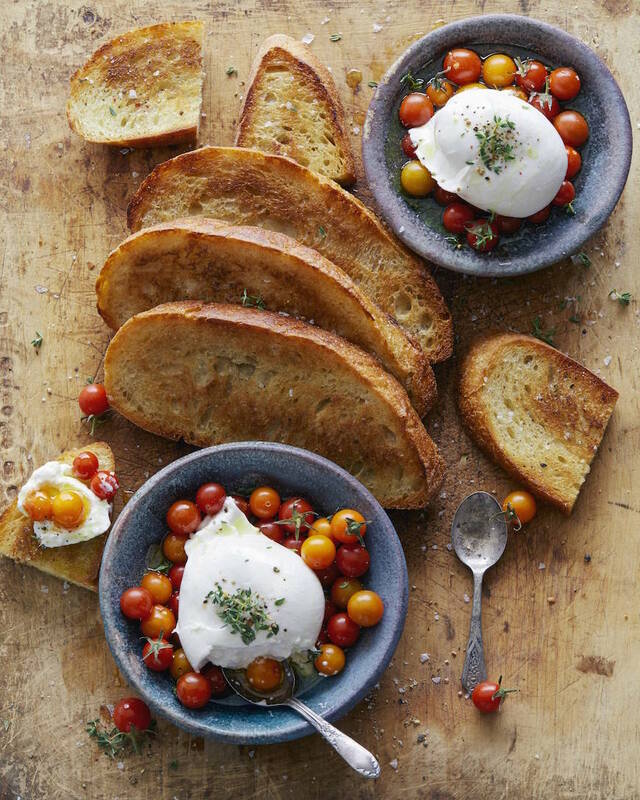 Looks so simple and easy but still so elegant- love that burrata! Yum!! Burrata on anything is perfection!! Guuuuuuuuurll, you’re killing me over here. This is on POINT!! p.s. – still so jealous of that Peru trip. Magical. Toast never looked so happy and delicious! Love these! Hope I can still find some of these yummy tomatoes. The whole thing looks perfect! Burrata is really the only way to ever go. Love these toasts! So funny, I was browsing through the toast feed from the feedfeed and saw this picture. I thought to myself that looks a lot like a dish from el pan de la chola. I love that place! Whenever I am in Peru visiting family I make sure to visit it. Yours looks great btw! I was just wondering, which bread you used in the above recipe for Burrata Tomato Toast?